Our hobby is often accused of being mindless entertainment. Games, we’re told, aren’t food for the mind – they’re quite the opposite, as a matter of fact. Playing video games will rot your brain as surely as watching television or browsing Reddit. Thing is, that’s not really true. Spent is a very simple game that’s designed to give you an idea of what it’s like to be one of the many low-income families in the States. In Spent, you’re tossed into the shoes of a single parent who’s just lost their house and their job. What follows is a difficult balancing act where you’ve got to work out how to afford food, rent, and incidental expenses – all while doing everything you can to keep your job. It’s actually…pretty depressing, and drives home just how dire the situation really is for people living below the poverty line. It’s kind of tough to talk about Every Day The Same Dream without coming across as a pretentious hipster (or spoiling the game), but damned if I’m not going to try. 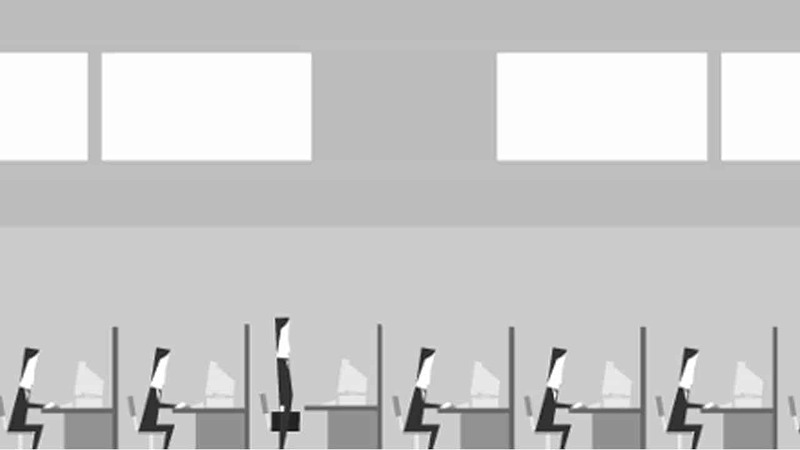 It’s basically a game about the day-to-day drudgery too many of us subject ourselves to. The way I interpret the game is that you’re a working stiff at a faceless corporation; a single servant toiling alongside hundreds (or maybe even thousands) of other employees. You share an apartment with your wife, and . The goal is to eventually break your little drone out of his monotonous routine, making him into a new person in the process. It won’t be an easy transition, mind you- the game’s simple, but the message it presents is both sobering and clear. Another highly artistic, somewhat abstract game, The End is all about life, death, and self-discovery. In The End, you have died. Everyone has, as a matter of fact. It’s the apocalypse – the world has ended. You and thousands of others have been cast adrift in the realm of the dead, where you’re to embark on a quest of self-discovery to reach “The end of the end.” Designed for users aged 14-19, the game features a quirky, appealing art style; entertaining physics and board-game based mechanics, and a whole host of deep spiritual and philosophical questions about life, the universe, and everything. It’s also free – give it a try. Ever wonder what it’d be like to live in a third-world country? Real Lives can answer that for you. Like Spent, it drives home just how rough things are for people less fortunate than you – even those living in the West. Developed back in 2002 by Bob Runyan, Real Lives goes out of its way to present an accurate, realistic portrayal of life all over the globe. Now, given the amount of work that went into this, you probably won’t be surprised to find out that Real Lives doesn’t come particularly cheap – a copy will cost you $29. I’ve written about The Stanley Parable before, but it’s definitely earned a spot on this list. It’s basically what you’d get if you took an existential crisis and translated it into a video game. It pokes holes into pretty near every facet of game development – and our day-to-day lives in the process. Toss in a bit of sardonic wit and an overly-sarcastic narrator, and this game is definitely worth the $15 you’ll spend to buy it. This list is just a sampling, remember. There are plenty of intelligent, mature, philosophical games floating around the ‘net just waiting to be discovered. I’ve just presented to you folks a few of my favorites – I’m sure there are more out there that I don’t know about.